There are currently 5,299 users on this website. I would like to share some of my Zeppelin covers. I have found very little information or examples regarding this flight from Berlin (Oct 8, 1919) to Stockholm Sweden (Oct 8, 1919) with green arrival cancellation on front and backstamped at postoffice Stockholm. It's adressed to Nordiska Kompaniet (The Nordic Company) which was one of the more exclusive department store in Stockholm (Inaugurated Sept 21, 1915). Didn't realise these stamps are worth a bit, I may have some in my box of unsorted stamps. This cover is a Sieger Nr. 19.K, Printed matter rate. Only thing and I would check is the green receiver. The example in the Sieger Catalogue, the 8 is straight under the B. May be nothing but a good certificat would be great. The route on 08.10.1919 was: Berlin/Staaken- stockholm and return. I havn't had the opportunity to compare the green receiver with other examples before. I agree that the one shown in Siegers cat. is slightly different, but that's not from an actual cover I believe? 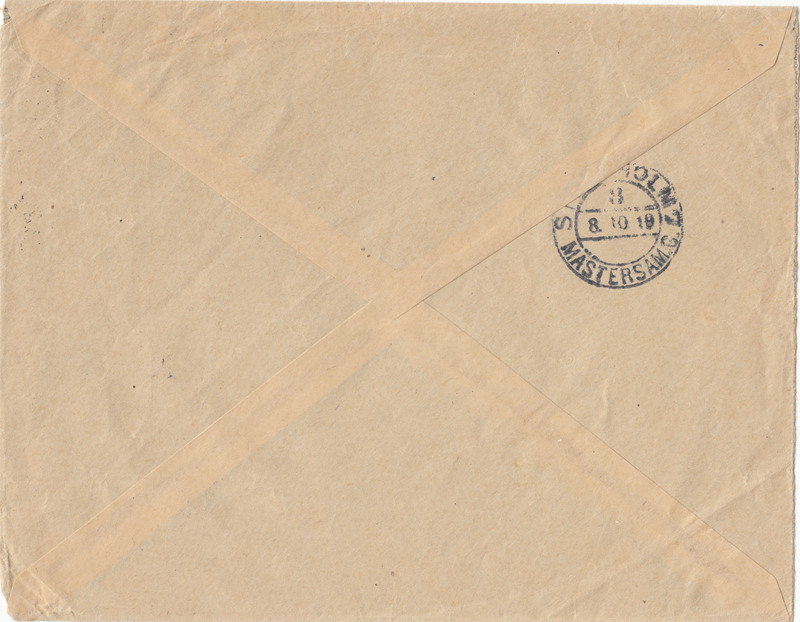 The example at Christ-Stamps in the link from perf12 above https://www.christ-stamps.com/en/i_...773&row_nr=2, shows two green receiver cancellation and the top inverted one shows even the left edge of the rubber stamp (before B) which also can be seen on my cover. In K.B Spezial Band I there is also an example with the left edge visible. I don't know if it's ok to show a picture from the book here. I would like to have an expert to look at the cover and eventually get a certificate, but I don't know where to ask. I have been in contact with Dieter Leder before in other matter, but I can't get in touch with him. You can contact Mr. Sieger at BPP, he is a senior member. The other two covers from this flight to make a set would be one with the "on board" cancel going to Stockholm and the one on the return flight from Stockholm back to Berlin. 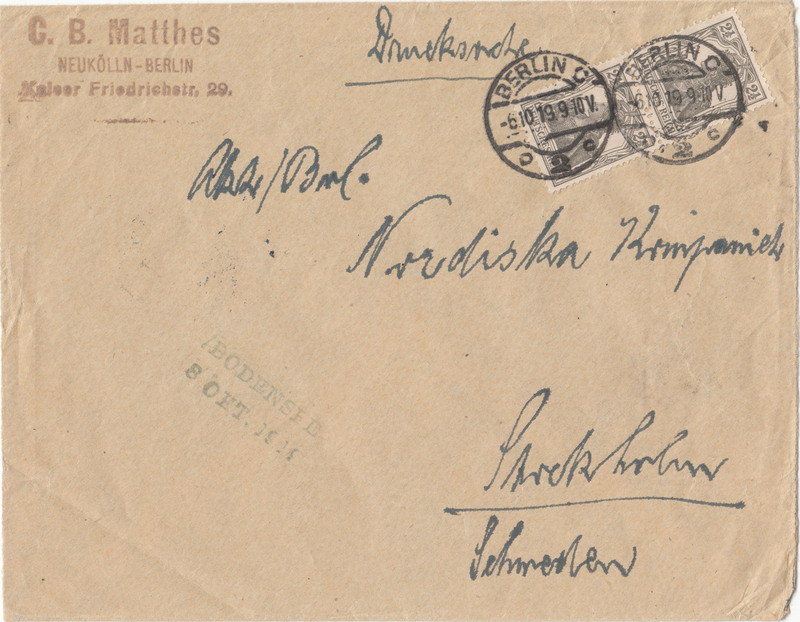 Yours looks like a nice example of the Berlin post office cancel to Stockholm, though the Stockholm receiving cancel on the back being partially covered by the flap would be something to get an expert to certify this as being right. @zepman, I'll check his contact info once at home on friday. @ Kimo, that's because it is a Printed Matter so the flap was not sealed for inspection. @Kimo, I have tried to contact Sieger with no luck. You are absolutely right about the flap on the cover. The part of cancellation not shown on the picture are visible under the flap. However, during the time there is a small (10mm) part of the flap glued to cover. Accidentelly or not I can't tell (It's on the tip). Unfortunately Dieter Leder seams to be offline, at least for me. Last time I heard from him was in may last year and I'm still awaiting for Zeppelin Post Journal 2017. My main concern for the cover was the postage. Is 5 Pfennig correct for Printed Matter? Dieter has fallen off the edge of the earth as far as I know. Are you registered with ezep.de? I've been trying to find out who TALLTREES is who posts a bunch on the forum. That seems to be the last active part of the group. There is a Face Book group that just formed that may be of interest.